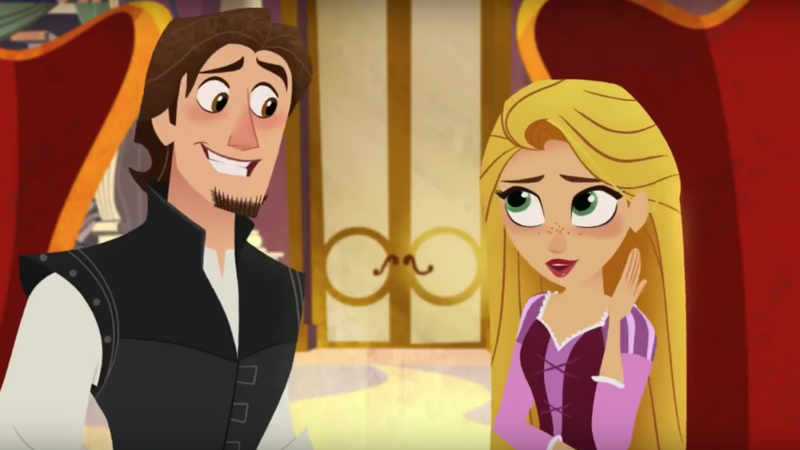 Disney Channel released the first trailer for the upcoming original TV movie, Tangled: Before Ever After, and I’ve got to admit...it’s kind of adorable. The Flash-animated movie (wait, people still use that?) takes place between the original film and the animated short Tangled Ever After, which showed Rapunzel and Eugene’s wedding. It’s all about Rapunzel getting some kind of random magic curse that makes her hair grow back, only it’s super-duper strong and can’t be cut off anymore. It seems like a pretty cheap way to justify giving Rapunzel her long blond hair again, but it makes sense why they’d do that, since it’s her signature look. While the animation does look pretty cheap, that’s kind of part of the charm. The style is kind of a mix of classic storybooks and old episodes of Rocky and Bullwinkle. Plus, Mandy Moore and Zachary Levi reprise their roles as Rapunzel and Eugene, and Alan Menken wrote some new songs for it. Sadly, there’s no Brad Garrett, or Donna Murphy as Mother Gothel. But the latter one makes sense since she’s, you know, dead. Tangled: Before Ever After airs in March, and will launch an animated series on Disney Channel called Tangled, presumably about Rapunzel and Eugene’s adventures as they try to fix her bad hair day.